With a fresh new calendar in front of us, January is the time of possibilities and new beginnings. It’s a special year for us, because we both have our first full-length Heartwarming books coming out in 2017. So, we thought we’d share some of our dreams and goals for this year. My daughters accuse me of being a “mean” driver. I don’t consider myself to be mean, I just have certain expectations of other drivers: turn your bright lights off when a car is coming toward you, signal your intent (everyone has blinkers) and don’t tailgate (my car is big and takes a while to stop). While I don’t ever use my horn (unless it’s to get my oldest daughter to move faster in the morning), I might not always keep my thoughts inside my head while I’m driving. So my goal this year is to be a “nice” driver and keep my commentary inside my car upbeat and positive (no more “mean mom” driver for me). And keeping with the positive and upbeat theme for the year I’m extending that attitude to my writing life as well. It’s easy to get caught up in comparing ourselves with our writers: AuthorSuzie writes 50 perfect pages a day, AuthorTina completes a 100-page outline for every book, AuthorSally has 10,000 followers and 20,000 likes, AuthorMary got a 12-book contract and the list goes on. Before we know it, the comparisons have overwhelmed our personal success and defeated us. This year my goal is to stay in my own writing lane, celebrate my writing successes as well as the successes of my fellow writers and remember we all have our own journey as writers and we need to enjoy the ride. And enjoying the ride applies to every part of my life, especially as my oldest daughter informed me this weekend that she has less than 9 months until she gets her driver’s permit. Welcome to 2017 everyone ~ it’s going to be a fun ride, I promise. Now over to Beth who I’m really excited to be blogging with this year …. 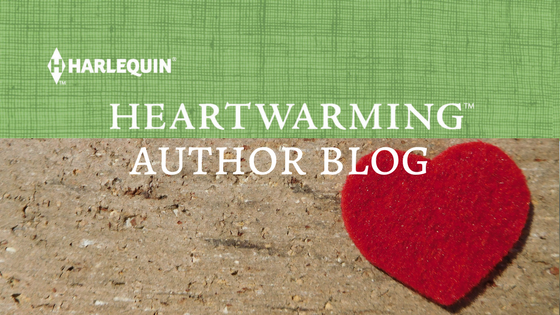 I’m thrilled to join Cari here today on the Heartwarming blog. It’s a dream come true to be part of the group of authors who’ve written so many of my favorite stories. I have two books coming out later this year, but in the meantime, I’m writing more stories. So, my first goal is to establish a regular time each day when I can write, uninterrupted. Which brings me to my second goal, training my family about writing time. I also want to establish a quarterly newsletter. I love it when those emails pop into my box now and then to tell me the news about my favorite writers and their new books. Of course, getting organized and establishing routines means it’s easy to get caught up in activity and forget to stop and enjoy the moment. That’s my last goal – to experience beauty in every day. THE CHARM OFFENSIVE by Cari Lynn Webb will be out in July. THE ALASKAN CATCH by Beth Carpenter follows in August. Hope your January is going well, and that 2017 is a special year for you, too. What’s driving you this new year? Cari, I was already looking forward to sharing a release day with you this July. It makes it that much more special to know it will be your debut Heartwarming novel! Beth, you have been so wonderfully supportive of Heartwarming authors for quite a while, it was such a natural and welcome transition when you joined our group. Congratulations and best wishes to you both with your upcoming releases! Thanks, Kate. I'm so happy to be here. Congratulations to you both on your upcoming releases! Beth, your photograph is stunning. Thank you, Jill. 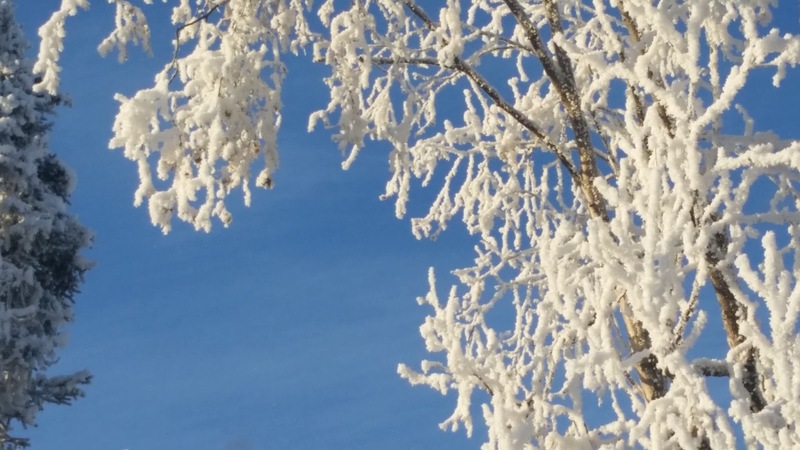 Those beautifully frosted trees tend to go with temperatures hovering around zero, so I'm glad I could see them from indoors. Happy New Year, ladies. I hope it all goes the way you're looking forward. Especially the driver's permit thing, Cari...shudder. We are so glad you're here. I remember those teen driving days with my kids, too. Scary. I enjoyed your posts Cari and Beth, about your dreams and goals for the coming year. Especially liked your line, Cari, about writing in your 'own lane'! All of us have our own styles, preferences and achievements but in the end, we're all writers. That in itself was a wonderful dream come true for me. All the best with your releases! Thanks, Janice. I think Cari said it well. It's going to be a fun ride. Congratulations, ladies!!!! I know you're so excited! And, Cari, next time I want to yell at the driver in front of me, I'll think of you and try to be nice. I also love the idea of not getting caught up comparing myself to other writers. I'm much slower than most writers I know. I tried to blame it on my 2 jobs (3 if you count babysitting my granddaughter on the weekends) and then I see the schedules of other people I know (hi Pamela Tracy!) and realize I'm just making excuses for myself. So this year I'm going to keep plugging away at my own pace and "get'r done." And Beth, let me know how the family training goes. I need some help in that area, lol!!! One word at a time. And if I discover and family training tricks, I'll let you know. Thanks, LeAnne. Congratulations, Cari and Beth! What a great idea to put your links on the post. I am now following you both and have liked your page! And this is the GREATEST group of authors ever. Thanks Patricia. I can't argue about the group, they are the greatest. Congrats on your first releases! That is so exciting! :) Looking forward to seeing you on the blog, as well. Great post, Ladies! Cari, I can't imagine you being "mean" about anything but your driving comments made me laugh. I'm always wondering if people had really bad driving instructors or if they just choose not use what they learned? Congratulations to you both on your upcoming Heartwarming books! Thanks, Carol. Imagine how hard it's going to be for Cari to stay "nice" about those other drivers when it's her daughter they're tailgating. Welcome, Beth!!! So great to have you on board. :) And Cari, what you said about not comparing yourself to what other authors are doing and accomplishing? That's gold. Can't wait to read your books, ladies! Thank you, Anna. I'm looking forward to my next visit to Butterfly Harbor and sharing a release date with you. Congratulations Cari and Beth! (Beth, you've been with us so long, I thought you were an 'oldie.') This is the absolute best group for encouragement and support - and a pretty willing audience to our rants. Pulling for you both to be big stars - and safe, serene drivers! Thanks, Muriel. I think we're sharing a release date as well. Congratulations ladies. Great post. Look forward to reading both books. That frozen tree is something. Thanks for the post, Cari and Beth. Cari, your driving issues make me smile. I tend to make many snarky comments to other drivers. I used to look like a crazy woman doing that while driving. Now people just think I'm on a hands-free cellphone. Beth, good luck in enjoying the moment. I'm looking forward to reading new releases from you both this year. Thanks, Patricia. I'm still not used to those hands-free phones. I keep thinking that person standing next to me at the store is talking to me, when she's actually having a conversation with her sister.